A business without funding is like the arteries and veins without the blood flowing through them.Funding is a power source on which a business runs. It has its own types and your businessʼs future is totally hinged on the type of funding you choose. Bootstrapping basically means self-funding or raising more for oneself. Bootstrapping has come from a famous legend Baron Munchenhausen who pulled himself out of the water with the help of his own bootstraps! Obviously, if your product and idea fits in the affordability of your situation, then bootstrapping is the best funding for early startups. You often own 100% of the company shares and hence have full control over the company. It keeps your costs minimal because obviously it’s all your money and you want to save it as much as possible . Bootstrap often leads to a positive cash flow . It has been explained by many entrepreneurs that when you put yourself in the sink or swim situation, you know you are hungry enough to do the business just right! Also, innovative ideas are also possible as everything is in your hands and no external pressure is put onto you. 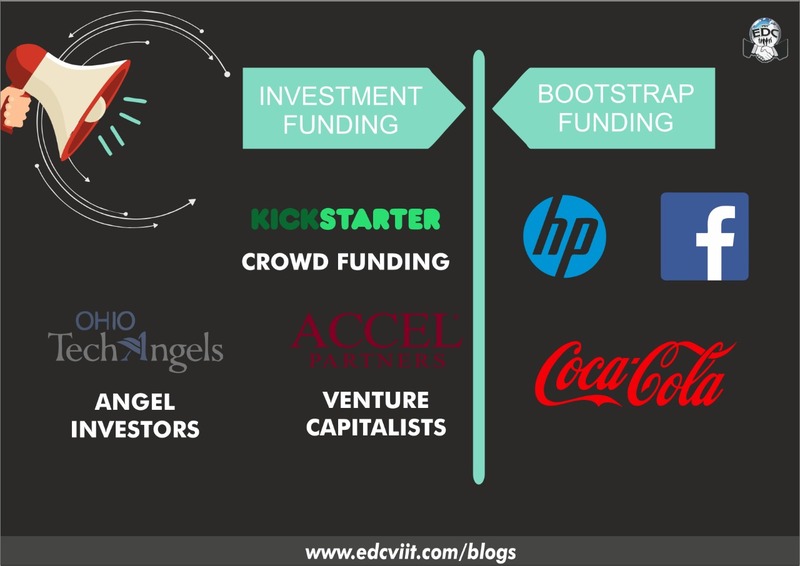 Facebook, Apple, Microsoft, Dell , Hewlett Packard, Coca Cola are all the best examples of bootstrap funding. eBay had its own undistinguished beginnings as a bootstrap enterprise. Fusion chart’s founder Pallav Nadhani started in 2005, at the age of 16 with complete bootstrap funding and now has a revenue of over 7 million dollars(40 crs.) which is used by over 80% of Fortune's 500 companies! Bryan Johnson - founder of Braintree, OS fund and Kernel says “ Bootstrapping is a force function for creativity and break through.” Nathan Chan ,CEO of Foundr Magazine says , “By self funding you have the ability to control your own destiny.” Focus on the profits, as bootstrap businesses grow slowly. Although the growth from this funding is slow at the beginning, you are always guaranteed with maximum income , having full decision making and business control .It provides peace of mind to the businessman and can focus on the execution of the business. An investment fund is a supply of capital belonging to numerous investors, used to collectively purchase securities while each investor retains ownership and control of his own shares. This is an external funding where you sell your idea to people who believe of getting profit out it. There are 3 sub parts in this type of funding: crowd funding , angel investors and venture capitalist. Crowd funding is basically raising funds from a large amount of people . This type of funding is often used by non-profit organizations , political campaigns, social entrepreneurship. ‘Kickstarter’ app is an active platform and got a crowd funding of over 2 billion since its launch in 2009. Angel investors are the well-to-do businessmen who provide you funding if they find your idea interesting. These people are more concerned with passion and commitment of the founders and the larger market opportunity that they have identified. They often expect high returns but on the other hand they share their own knowledge and experience with you which really is an important factor in early startups. Angel investors are generally your family, friends or your well wishers and are more concerned about your grown in the business than the profit or loss the might have to incur. Jeff Bezos, the founder, President, CEO and the Chairman of Boards of ‘amazon.com’ has invested in 11 companies starting at $1.5 million and been an angel investor. Also Paul Buccheit a partner at Y combinatory , a Silicon Valley based seed accelerator has funded more than 550 companies like Reddit , Dropbox and Airbnb in more than 30 markets. A venture capitalist is an investor who either provides capital to startup ventures or supports small companies that wish to expand but do not have access to equities market . Venture capitalists are willing to invest in such companies because they can earn a massive return on their investments if these companies are a success. They ask for ownership equity. Investor funding is often pertained if a lot of cash is required. You have to have the ability to gather more credentials. Before approaching an investor you should be thorough with your pitch, its outcomes and your idea! You should have a proper media coverage , market study, early community of clients ,etc. The growth rate is quite fast after this getting the funds. Huge skills are available as the investors might provide you with the resources as well. You have a lesser control over the company compared to bootstrapping as the majority of the company around 50-60% is owned by the investors. You also have to agree with all the terms and conditions of these investors and work accordingly. For example, Helion Venture Partners is a VentureCapitilist investing in technology-powered and consumer service businesses. Helion Ventures Partners is a $605 Mn Indian-focused, an early to mid-stage venture fund participating in future rounds of financing in syndication with other venture partners. It invests between $2 Mn to $10 Mn in each company with less than $10 Mn in revenues. Hence, choosing what type of funding you want is really very crucial and hence it should be given utter importance in your startup plan . So ,before deciding the mode of funding for your startup there some questions you need to ask yourself :What is the ultimate aim of your business ? How much control you would want to have on your business? What returns you are expecting from your business? Remember, if a funding strategy has worked for a particular business model, it is not necessary it will work for you. As every business have different goals and challenges, every business needs a unique approach towards developing a solid plan for the success of their big idea. Dreaming big is not difficult, but giving what it takes is the real deal! So get ready to step yourself in the grand and beautiful entrepreneurial market with preplanned positive ideas.